Roberta was hooked the first time she struck iron. “There is something wonderfully indescribable about the energy exchange that takes place while blacksmithing.” She’s especially facinated by “forge welding” in which two or more pieces are heated to 2600 degrees, then carefully introduced to each other and hammered into a single piece. She uses this process to introduce texture and images to the surfaces of her work. “Vigilance and focus are required; uncertainty and excitement are part of this process.” It’s amazing how the resulting, beautifully delicate details in her work take serious extremes to achieve. 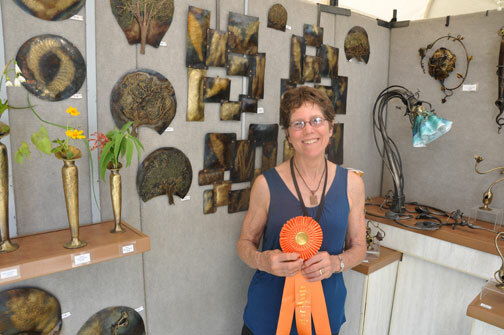 To learn more about Roberta and see more of her work, click here.